Is It Bad to Watch TV in the Dark? Are you fond of watching television in the dark? Nothing beats the feeling of watching your favorite show or movie in the dark. It feels like you’re watching it in the cinema – your eyes all glued to the screen without any distractions that will keep you from enjoying what you’re watching. Watching a horror movie? You won’t enjoy the scariness unless you’re watching it in the dark room – with the shadows around you adding effect to make your heart pound faster. Are you planning a romantic date night with your partner? Watching a romantic movie while all cozied up in the dark and holding each other sound like a perfect night. Most of us all look forward to ending our crazy day by spending a few hours in front of your television, with all lights turned off. However, is it bad to do it? Does it have any negative side effect to our health – more particularly to our eyes? Some people, especially of older age, believe that watching TV in the dark is not good for your health. You may have even experienced being scolded by your parents or grandmother for watching television in a pitch-dark room. 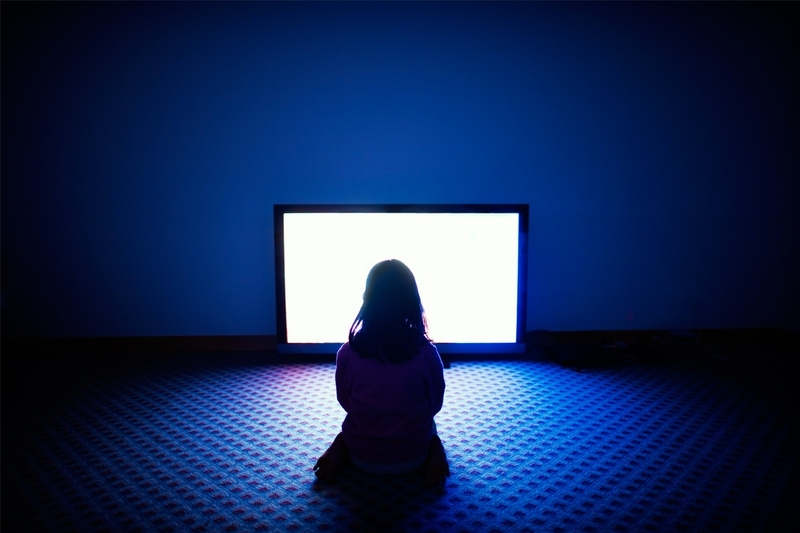 To set the record straight, watching TV in the dark is not bad for your over-all health. It does not cause any long-term damage or life-threatening consequences. However, you have to take note that it’s not good for you either. Though it won’t weaken your eyesight or permanently damage your eyes, watching television in the dark can cause temporary problems – such as eyestrain and headaches. When you’re watching television with all the lights turned off, your eyes would have to adjust constantly to the changing lightening brought by the contrast of a bright screen and a dark room. The eye muscles are forced to work harder to cope with this lightning contrast. Also, you tend to blink less in the dark room because you’re focusing more intently on the TV screen. These factors, combined with eye strain, can cause fatigue, headache and blurry vision. So is it bad to watch TV in the dark? Your eyes would instantly say yes to this question. If you think that only people who are watching television in the dark should pay attention to it, think again. Actually, what we often use today does have similar problem. Most of us are guilty of using our computers in the dark too. We seem to enjoy immersing ourselves in the world of internet with our eyes solely focused on the computer screen while all lights in our rooms are turned off. Televisions screens and computer monitors are now manufactured almost similar; hence you are putting your eyes on the same risk as watching TV in the dark when using your computer in the dark room. Eyestrain is one of the most common problems of younger generations who spend countless hours in front of their computer. Do you still remember how you were scolded by your parents when you read in the dark? They warned us that reading in the dark can impair our eyesight forever. Nowadays, more children and teenager are hooked on tablets or e-readers. It’s a convenient alternative to still be able to read their favorite books or cartoon series when lights are all turned off. However, it poses the same risk to your eye, just like it is bad to watch TV in the dark. Make sure that you have a secondary light source or adjust your screen to a softly lit background light. This way, your eyes won’t be strained from trying to adjust to the contrast of the bright screen and dark surroundings. Is it bad to watch TV in the dark? In a general perspective, it's not; however you should bring your eyes into the picture and take consideration the eyestrain that it can cause to the window to your soul. Most of us don’t really pay attention to eyestrain. Since it’s a temporary condition, it won’t cause any long-term effect. You just need to rest your eyes for a while, then everything will go back to normal. Though this is generally correct in the short term, recurring eye strain has been associated with farsightedness, presbyopia and even glaucoma. Lower the brightness – This is the first step to avoid eyestrain. When you lower your television’s brightness level, you don’t force your eyes to work too much as your television screen and your surroundings are at a constant level of lighting. Lower the contrast – Your eyes won’t need to re-adjust too much since the colors and brightness are closer together if you lower your television’s contrast. Avoid sitting too close to the screen – Being too close on the television screen will force our eyes to work too much, hence resulting to eye strain and fatigue over a long period of time. Place yourself in a spot where you’re not too close or too far from your television screen. Avoid glare – In addition to the flickering and glowing lights, letting glare get in the way can cause your eyes to work more as it needs to focus on the screen. Avoid any light sources opposite your TV screen such as an open window. Think low lighting – Instead of watching TV in a pitch dark room, set up smaller lamps in your room to create a homely glow. This is friendlier to your eyes, plus you get a cozier atmosphere.